Cute Yue Fei and Xiao E couple moment. About time. He apologizes and asks how he can make it up to her. Xiao E tells him that she understands his mission; she won’t ask for him to be by her side every day, but only that he can defeat the Jin army. Baddie general thinks bad thoughts and tries to sneak some poison into the food. Too bad Xiao E is always there. AW Yue Fei’s oldest son is practicing archery with daddy Yue. Uh oh, Yue Fei’s vision is going a little whack. He misses the target completely. Su Su seemingly heals him, and Xiao E smiles adorably at him. Bro Squad visits the restaurant. Hee, the girlie is all over him, and Bro Squad pokes fun at Iron Ox (I’m gonna have to come up with a new name for him…Ox boy). HEE SO CUTE, this group. The next morning, Ox boy wakes up naked. He runs from Gui Niang (the girlie), who confesses that she really likes men like him. Su Su has a fight and makes up with her dad. BUT OH NO, Su Su’s dad gets captured by General Du. Wu Zhu wants to use Daddy Zhang to cut off Yue Fei’s food supply. Su Su falls into a trap when she tries to rescue her dad. She fights off numerous soldiers and tells her dad to run. Aw girlie, I like you a lot better when you’re not making eyes at Yue Fei. 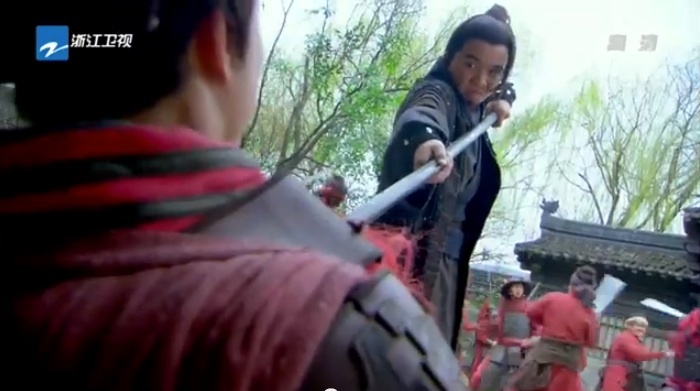 Yang Zai Xin joins in the fight and he faces off with Wu Zhu. 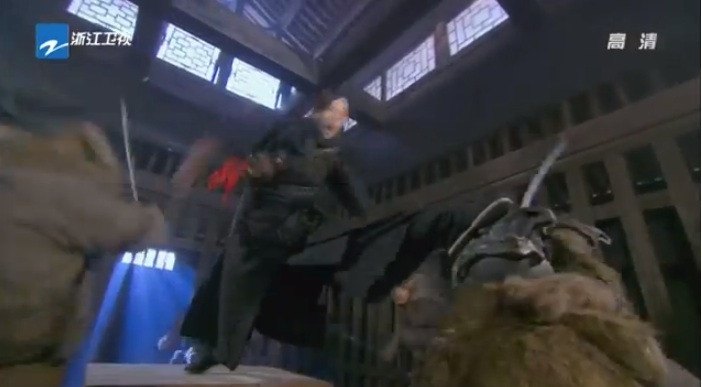 Yue Fei and the rest of Bro Squad get into the fight as well. OHMYBAJIGGERS baddie general trap Yue Fei’s family at the house. Too bad Gao Chong stops them. YEY new bromance. Baddie general finally dies in the scuffle. Everyone returns to camp and they tend to the wounded. Yue Fei finally sees what happened while he was gone. Wang Gui kneels there with the saddest look on his face. WHAT WHAT WHAT HAPPENED. Oh poor baby is sad over the casualties from leading soldiers into a Jin trap. Yue Fei gets angry and orders Wang Gui to be beheaded. WHAT. Finally, Xiao E comes in and takes responsibility. Yue Fei yells at her in front of the entire army too. YUE FEI IF YOU LET HIM DIE LIKE THIS……Xiao E asks to be beheaded, since it was her fault. Momma Yue walks in and finally talks some sense into Yue Fei. Why was this issue blown out of proportion like this. At least it all just makes me love Bro Squad and the Yue Family even more. The wounded soldiers all rally behind Wang Gui, and they shout that they don’t blame Wang Gui for the casualties. 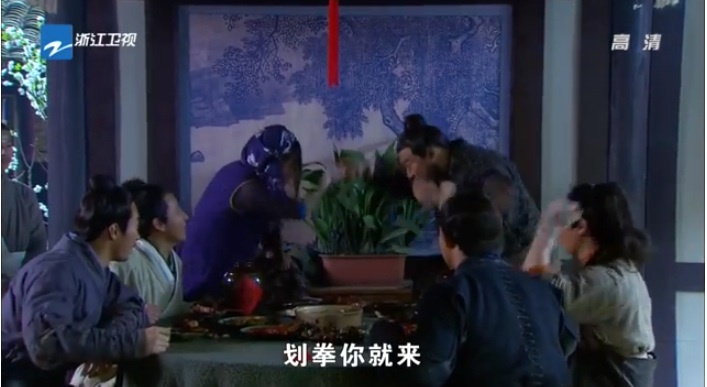 Ox boy runs in late and starts shouting at Yue Fei to let Wang Gui go. Wang Gui gets his life back, but is punished by 100 hits (I don’t know how to translate this…it’s like a harsh spanking, but that doesn’t sound hard enough. It’s not a lashing either). Liu Shi Shi’s character finally regains her sight. Su Su flashes back to when Yue Fei saved her. No girl, that’s not the way to go. Yue Fei comes by to check on her. One of my complaints against Yue Fei is that he is so lenient with his enemy Song generals, but so harsh on his own fellow brothers. My heart hurt for Wang Gui, especially when he shed a few tears while immobilized on the bed. 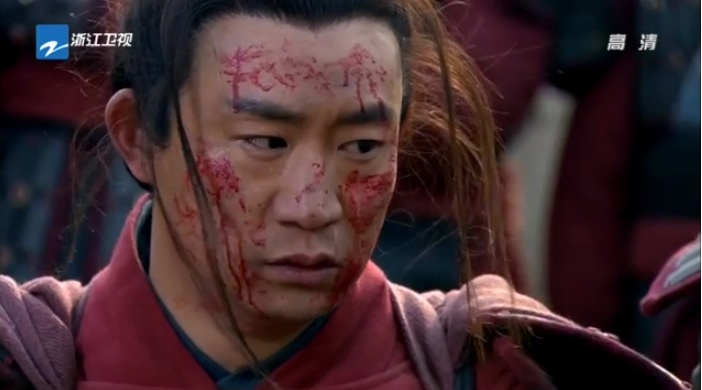 This entry was posted in Chinese Dramas, Drama Recaps/Reviews and tagged 精忠岳飞, Episode 37, Episode 38, Huang Xiao Ming, Jing Zhong Yue Fei, Patriot Yue Fei, Recap. Bookmark the permalink.